Please review our advertising terms and policies before contacting us about advertising on our site. Terms are non-negotiable and we always reserve the right of final refusal on advertising here. Hi... 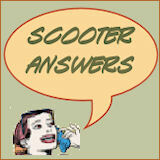 I'm Kathi MacNaughton and I am the webmaster for this site. Although I did create this site partly as a money-making project, it is also my "baby". I am an enthusiastic and dedicated scooter rider and the scooter community has responded to my voice and purpose on this site with an incredible level of support. My scooter family loves what they find here and I don't want the advertising I allow to change their minds. So, while I have decided to accept ads on the site, I am the final decision maker as to where those ads will be placed, how many can run, and whether a particular ad will be accepted at all. I would never want advertising to dilute the quality of this website in any way. I hope you will respect that. All ads MUST be relevant to road-worthy gas or electric scooters. This site is about 2 (or sometimes 3)-wheeled scooters. It is NOT about mobility scooters, mopeds, push scooters or even motorcycles. It is certainly not about cars. The only ads I will even consider MUST be about scooters, scooter parts, scooter gear or the like. I might accept ads from motorcycle gear companies, as motorcycle gloves, helmets, jackets and the like can also be worn by scooter riders. All links will be no-follow. When you pay to run an ad on this site, you're not paying for text links or to have page rank passed on to you. That goes against Google policies and I will stay in compliance. If that doesn't work for you, I'm sorry. It's not something I can change. All advertising and payment options are subject to availability. I am not planning to run unlimited numbers of ads. So, depending on when you contact me, I may or may not have certain ad placements and sizes available. NO ads will be accepted for the home page. I prefer not to have much advertising (or any) on my home page. The only way to have visibility on the home page is to purchase sitewide advertising space on the sidebar. I cannot accept animated or flash-type ads. I don't want flashing, moving billboards on my site. Ads may be textual or graphical in nature, but if graphics are used, they must be static images. Advertising article pages must be content-rich AND relevant. As with all ads that run on this site, the content must be relevant for my scooter-riding audience. While I will consider an advertising article that simply describes your business, my preference is to have articles that provide some kind of value to my visitors, such as how to articles, articles on choosing the best of something, etc. They must also be written using good English and following proper grammar, punctuation and spelling rules. If I have to edit them heavily, they probably won't be accepted for publication. All advertising transactions are conducted over the Internet. I prefer to do business via email, rather than telephone, as I find it works better with us being in different time zones, etc. On occasion, I might be able to make myself available via instant messenger chat as well, though email will always be my preference. In addition, payment is preferred through PayPal and must be received before an ad will run on my site. Additional terms or changes in the above terms may occur at any point in time. I reserve the right to modify these terms as I see fit. If you have any questions about my advertising terms, please feel free to contact me.